Plants perennial, mat-forming; rhizomes evident, short to rather long, 2-3 mm thick, firm, cortex persistent, internodes very short to 2 mm, scales often decaying to coarse fibers, 5-12 mm, papery. Culms subterete to greatly compressed, to 5 times as wide as thick, often with 2-12 ridges, 8-45 cm × (0.2-)0.5-1.8 mm, firm to hard, spongy. Leaves: distal leaf sheaths persistent, not splitting, proximally red, distally green to stramineous, papery, apex usually red-brown, broadly obtuse to sub-truncate, callose, tooth absent. Spikelets ovoid, 4-8 × 2-4 mm, apex acute; proximal scale clasping 3/4 of culm to amplexicaulous, entire; subproximal scale empty or with flower; floral scales spreading in fruit, 20-60, 6 per mm of rachilla, medium brown to very dark brown, sometimes stramineous or colorless, midrib region often paler, ovate, 2-3(-4) × 1-1.5 mm, apex acute to acuminate, the apical colorless hyaline region mostly longer than wide and 0.6-1.2 mm, in proximal part of spikelet 2-fid to shallowly cut, rarely entire, in distal part often entire, carinate in distal part of spikelet. Flowers: perianth bristles 0-5, stramineous, length variable, to equaling achene, obscurely to clearly retrorsely spinulose; stamens 3; anthers yellow- to orange-brown, 0.7-2 mm; styles 3-fid or some 2-fid. Achenes falling with scales or some persistent, yellow-brown or dark brown, obovoid to obpyriform, nearly equilaterally to compressed-trigonous or usually some biconvex, angles evident or obscure, 0.8-1.1 × 0.6-0.8 mm, neck very short, finely rugulose and sometimes finely (or coarsely) cancellate at 10-20X with 14-20 blunt horizontal ridges in a vertical series. Tubercles brown (to whitish), pyramidal, usually depressed, often rudimentary, 0.15-0.3 × 0.2-0.35 mm. 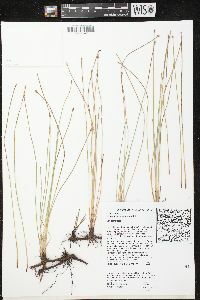 Eleocharis compressa is extremely variable. 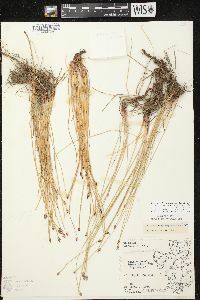 After E. bifida and E. occulta are segregated from E. compressa (type from Ohio) and E. acutisquamata (type from Texas), the remaining plants intergrade completely and are best treated as varieties of E. compressa (S. G. Smith 2001). Because some plants of E. compressa approach E. elliptica some authors have treated E. compressa as a synonym of E. elliptica. Putative E. compressa × E. erythropoda hybrids from southeastern Ontario have been described (P. M. Catling 1994), and I have observed similar putative hybrids in the field in southeastern Wisconsin. Introgression from E. erythropoda is suggested by the presence in many plants of E. compressa of some 2-fid styles and biconvex achenes and some or rarely all entire floral scales, including the type. 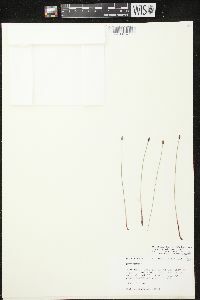 Some collections of E. compressa from the District of Columbia region and Tennessee have distinctly cancellate achenes as is common in E. tenuis var. verrucosa. 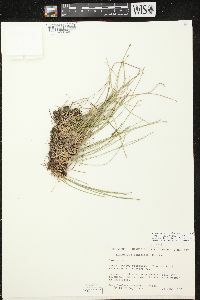 The earlier name E. acuminata (Muhlenberg) Nees, name confused (H. K. Svenson 1932), is often given as a synonym of E. compressa (S. G. Smith 2001). 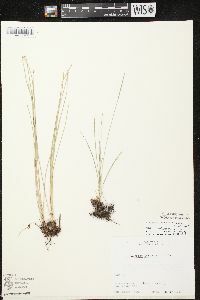 Both 2n = 24 and 2n = 26 cytotypes for E. compressa from south-central United States have been reported (L. J. Harms 1972). Fertile artificial hybrids between these two cytotypes were also reported, as well as artificial E. compressa (2n = 36) × E. elliptica (2n = 38) hybrids with meiotic pairing and pollen stainability more than 90 percent. 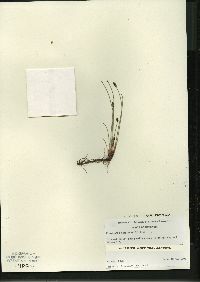 I have not seen voucher specimens for those artificial hybrids or for any of the published chromosone number reports for E. compressa, except for a count of 2n = 24 (presumably made by L. J. Harms) that is given on a herbarium specimen label of E. compressa var. 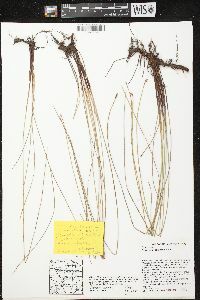 acutisquamata from Kansas (S. G. Smith 2001). 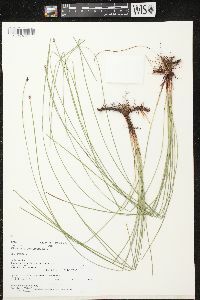 Perennial herb with slender rhizomes, mat-forming 8 - 45 cm tall Leaves: reduced to bladeless sheaths, basal, two per culm, margins fused and enclosing culm, not splitting, red basally, reddish brown at the apex, papery, with a blunt to nearly truncate (cut straight across) apex that sometimes bears a tiny tooth. Flowers: minute, spirally arranged on the axis of the spikelet, lacking sepals and petals, with zero to five bristles, subtended by a scale. 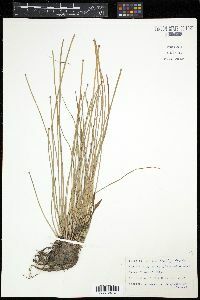 Bristles (when present) straw-colored, equal to or shorter than the achene. Stamens three, exserted. Anthers orangish brown to yellow, to 2 mm long. Pistil one. Style three-cleft, or some two-cleft. Fruit: a one-seeded achene, yellowish brown to dark brown, 1 - 1.5 mm long, to 0.8 mm wide, reverse egg-shaped to reverse pear-shaped, three-angled (nearly equilaterally to compressed), some convex on both sides, finely wrinkled, sometimes finely latticed. Tubercle brown to whitish, tiny, pyramidal, often depressed. Seed with a thin, non-adherent wall. Culm: unbranched, 8 - 45 cm long, 0.5 - 1.8 mm wide, nearly circular in cross-section or compressed to five times as wide as thick, often twisted, two- to twelve-ridged, spongy, enclosed basally by two fused sheaths. Spikelets: solitary, 4 - 8 mm long, 2 - 4 mm wide, egg-shaped with a pointed apex, with 20 to 60 floral scales. Scales spirally arranged and overlapping, brown to dark brown with a paler midrib, sometimes colorless or straw-colored, hyaline towards the apex, 2 - 3 mm long, 1 - 1.5 mm wide, egg-shaped with a pointed apex, some becoming two-cleft or torn-looking with age. Habitat and ecology: Occasional, especially in the southwestern sector of the Chicago Region. Found in moist to mesic areas of calcareous prairies. Etymology: Eleocharis comes from the Greek words heleios, meaning "dwelling in a marsh," and charis, meaning grace. Compressa means compressed.